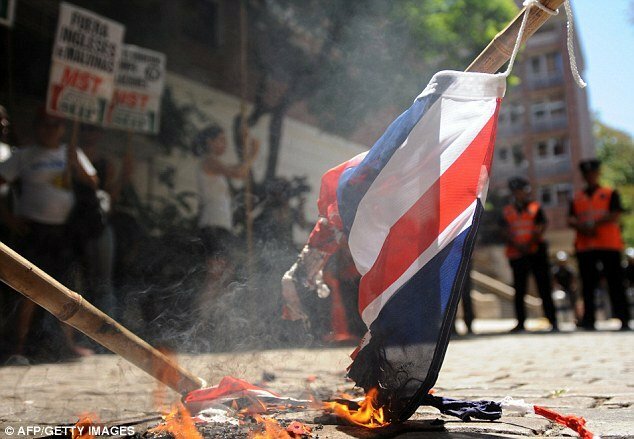 Around 100 left-wing activists have protested by burning Union flags outside the British embassy in Buenos Aires on Friday to demand Argentina break off diplomatic relations with the UK over the Falkland Islands dispute. Tension has been increasing ahead of the 30th anniversary of the Falklands War in April. Argentina is demanding talks on its claim to sovereignty over the territory, which it calls Las Malvinas. But the UK has reaffirmed that the Falklands will remain British for as long as its inhabitants want. The protest in Buenos Aires was organized by the Socialist Workers’ Movement (MST). Activists carried banners reading “Government break off relations now,” and “English out of the Malvinas”. “It is unacceptable that they send reinforcements and that the little prince (William) should come on manoeuvres,” said protest leader Wilma Ripoll of the MST. Willma Ripoll added that her group was planning further protests before Prince William – who is the second in line to the British throne – arrives in the Falklands next month for a tour of duty as a helicopter rescue pilot. The protest comes amid an escalating war of words between London and Buenos Aires over the Falklands. Argentine leaders were particularly angered by comments made by the British Prime Minister David Cameron on Wednesday, when he said Argentina’s demand for sovereignty was “like colonialism” because it ignored the islanders’ right to self-determination. He also said he had reviewed the Falklands’ military defenses and was prepared to send reinforcements if necessary. Tension over the remote South Atlantic archipelago has been growing since 2010, when British companies began drilling for oil in waters off the Falklands. Argentina has been rallying support for its claim from other Latin American nations, and President Cristina Fernandez has accused Britain of “arrogance” and “taking Argentine resources”. Britain has held the islands since the 1830s, but Argentina insists it has a prior claim and in 1982 launched an invasion. A British task force recaptured the islands in a short but bloody war in which 649 Argentine and 255 British servicemen were killed. The US has called for dialogue between London and Buenos Aires to resolve the dispute. “We recognize de facto UK administration of the islands, but take no position regarding sovereignty,” the State Department said.